Today we are talking about bathrooms! Here at Avery Cox Design we have been immersed in bathroom design the last few weeks and thought it only fair to share some inspiration with you all. When it comes to bathrooms, there are so many options available to everyone, so where do you start? Whether you want light and bright or you are craving color, both directions have endless (and FUN!) possibilities. Check out the bathrooms below and some reasons why we love them! If color isn’t your thing, a bold black and white pattern in a white bathroom adds instant interest without darkening the space. Not all colors will darken the space. These greens are subtle enough so when used on all walls, they make the space feel larger! For these two bathrooms, color is introduced into the space through a few elements. Adding a rusty orange paint above your tile draws the eye up, while a blush bubble chandelier and rose tinted mirror softens the marble and brings playfulness to the room. We are all about jewel tones, and this navy is no exception! Here are two more examples of how color from floor to ceiling makes the space feel larger. When you opt for a darker color, the space feels cozier as well. Here is some international inspiration from Avery’s latest research trip! 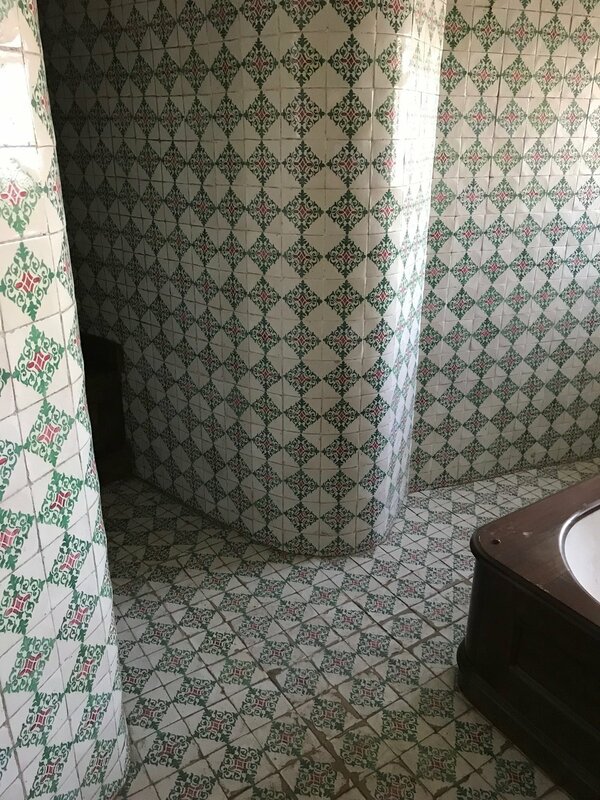 The Portuguese were ahead of the full tiled bathroom trend like this one from Pena Palace completed in 1847. By applying the same time everywhere it creates consistency and helps force an otherwise busy pattern to read as a solid. We also love the idea of having a cozy fire place in the bathroom. How luxurious is that?